While I was busy taking photos of the mason bees coming to the crocuses yesterday, I happened to notice that one was carrying around some extra baggage. I’ve seen insects with mites before, of course, but they’re always small and round. And I knew that there are some invertebrates like pseudoscorpions that can hitch rides on bugs or beetles, often hiding under the wing covers. But this didn’t look like one of those, either. 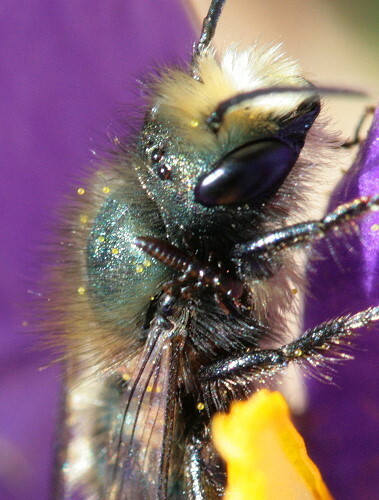 It remained close to the bee’s shoulder, even when the bee took off and returned a few times. So what was it? So what’s the significance? 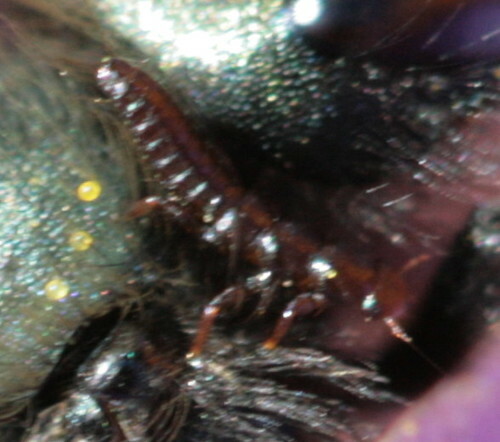 The female blister beetle of this species lays her eggs on the flowers of species that the target bee likes to visit. The larvae hatch out quickly, and when a bee comes along to visit the flower, one or more will jump on. If it’s a male bee, they ride around with him till he finds and mates with a female, whereupon they transfer buses. If it’s a female bee, they travel along to their final destination: the bee’s nest. As she works to provision each cell with pollen before placing an egg on it, the triungulin will jump off and make itself at home. It will eat the pollen the female bee collected, as well as the egg itself. It grows and matures, and eventually will emerge from the nest to go on to repeat the cycle. In another species, which I found and profiled a year and a half ago, instead of the triungulins hanging around on flower petals, waiting patiently for a bee to happen along, they take a more proactive approach. Once they hatch, all at roughly the same time, they crawl up a twig or grass stem and form a large cluster at the top, about the size of a bee. 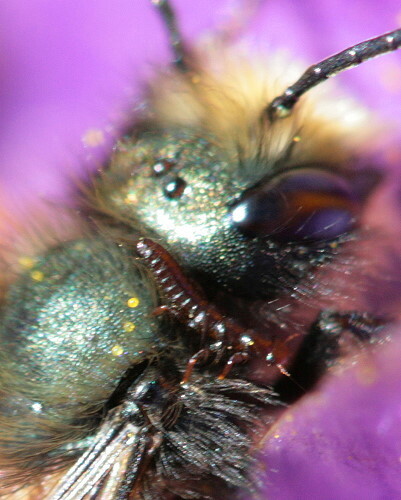 Then they emit a pheromone that smells just like the female of the species of bee they want to lure in. When the horny male arrives they all climb on board and then transfer to the female when he finally finds a real one. That wasn’t the only inter-species interaction I witnessed, though. 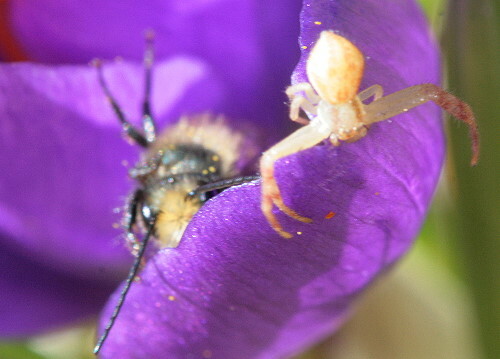 This crab spider was hanging out on one of the crocuses as well. Mostly it just sat there, but when this mason bee got just a little too close, it lunged. The bee got away. Bravo. Very cool post and pictures. Holy cow. Great catch! What a fascinating bit of learning that was for me (like you, my first question was “I’m sorry, but what precisely is a triungulin?”). A-mazing! The more I read about insects, the more parasitism I encounter. I hope I never come back as an insect! Hi young lady. I am horrified for that blue orchard bee…how awful…not only does that amazing little creature hv to deal wth “man” and all his deadly poisons…it has its own Godzillas to deal wth…thx for teaching an old lady something new…keep up the incredible work u do…what can “man” do to help preserve the future of this little miracle? ?